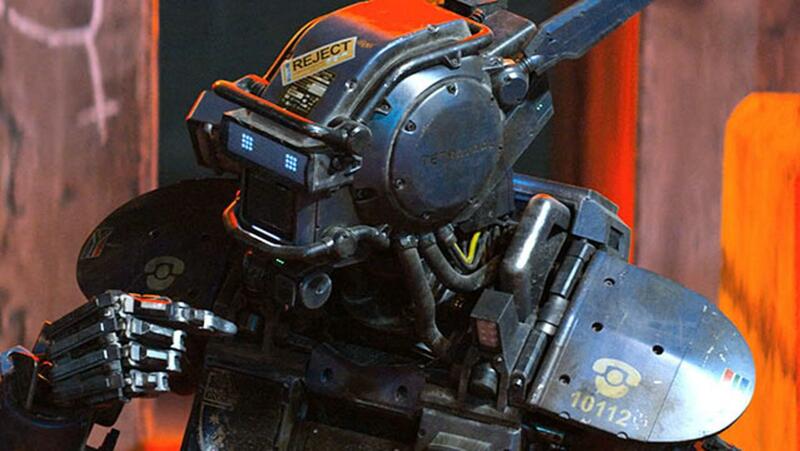 Objectively, Chappie is a mess. Everything else depends on you. This one is going to divide people. I pretty much guarantee that. See, objectively, Chappie is a giant mess, a film that alternates between working totally and failing to work at all for long stretches because of multiple creative decisions that, again objectively, cripple the film from its full potential and run the risk of derailing the ride. Whether or not they do depends on how much the stuff it does right offsets for you the stuff it does wrong, and how much its delightfully earnest tone and mood either wins you over or turns you off. Or, to put it another way, this is Jupiter Ascending all over again. For me, personally – as a review is simply one person’s subjective opinion, after all – I sort of liked it. I mean, I didn’t love it and disappointment is a major emotion mixed with that liking because the decisions and things required to make Chappie a better film are so thuddingly obvious that I grow ever more frustrated over them not having been done in the first place, but I sort of liked it. It is a rather wasted opportunity, though. After all, that great film was poking its head out so often and so obviously that I couldn’t help but fixate on all of the things that this OK film was doing wrong, much to its detriment. What Chappie gets right, though – and I feel that it is necessary to get through what Chappie does right first before we dive into the stuff it does wrong – it gets right. Chappie itself, for example, is pretty much note-perfect. The film takes the metaphor of the birth and subsequent burgeoning of Artificial Intelligence almost literally with Chappie having a personality akin to that of a 5 year-old. It’s easily scared, calls out to its “Mommy” when anything bad happens, is overly trusting of people, and is filled with a child-like wonder of the world and a very child-like binary view of right and wrong. It’s rather pure, basically, a force of possible absolute good and purity, and Chappie never undercuts Chappie, never insults its worldview as naive or stupid, and that kind of sincerity is probably going to be the main thing that divides people. I personally bought into it. For one, I still, even at age 20, have a relatively absolute view of right and wrong and can be somewhat naive and overly trusting, so I saw bits of myself in Chappie. For two, a protagonist of genuine good is a nice change of pace from a gluttony of anti-heroes and villain protagonists that often front more adult entertainment these days. And for three, Sharlto Copley is brilliant as the mo-cap and voice of Chappie, infusing it with the softness, sentimentality and sincerity required to make the character work. It’s the polar opposite of his work in Elysium and is yet another example of the surprising amount of range the man has. Meanwhile, when the film actually sticks to its wheelhouse, it also manages to be interesting thematically, too. See, despite what the trailers (which I saw after having seen the film) would lead you to believe, Chappie is actually more concerned with questions of parenting, abusive families, and the cycle of poverty and crime that can ensnare even the most kind-hearted if their situation is desperate enough. Chappie’s maker, Deon (Dev Patel), ends up being kidnapped by a trio of gang members (one played by Jose Pablo Cantillo, the others played by… you know what, I’m gonna hold off on that for a minute) and forced to activate the AI-uploaded police scout robot that he was planning to test at home for them because they need to pull off a $60 million heist, lest they be killed in a week by Johannesburg’s ruthless gang leader. From there, the central conflict of the film comes from the various parenting styles pushed upon Chappie. Deon wants it to expand its creative horizons and become a pacifist, shining beacon of humanity and the future but is, by necessity, an absent father. One of the male gang members wants to pretty much brutalise it into helping them carry out the heist that it has no desire to get involved in – “Heists is crimes” Chappie repeatedly adorably explains – which also involves snuffing out any possible traces of weakness (that mostly manifest as femininity) and bending the truth to get it to co-operate. Meanwhile, the female gang member adapts very quickly to the mother role and just wishes to support Chappie no matter what it does or what happens to it. The writing of this is typical Neill Blomkamp melodrama – Deon at one point yells at the gang that they’re all “philistines” as he escapes, in case you needed an indicator of what we’re operating at – but it still mostly works anyway. Dev Patel is committed to the part, Chappie itself as mentioned is adorable and Copley is fantastic in the role, and the film itself, when it is actually focussed on the theme, follows it through with aplomb, playing it for equal parts quietly sad drama and surprisingly funny comedy. Again, when Chappie works, and it does for long stretches, it’s great. Blomkamp’s distinctive visual palette is still in full effect, Hans Zimmer’s score is surprisingly pretty when it’s not drowning every last ‘dramatic’ scene in enough portentous strings to make a Goth dress from, and the film always had my attention for all 120 of its minutes. Unfortunately, there are also long stretches in which Chappie does not work. Like, at all. Specifically, Blomkamp really has a problem with not throwing everything, the kitchen sink, and the kitchen sinks of the next four houses down from him into a story that really doesn’t need them. It’s not enough that Chappie is mostly about parenting, apparently; Blomkamp also has to throw in questions about the nature of AI, the desire to live, a weapons company that manufactures the security bots that Chappie is born from (headed up by an utterly wasted Sigourney Weaver), a maniacal crime boss who threatens the gang but doesn’t really do anything, and a disgruntled god-fearing gun-nut ex-soldier-turned-programmer (Hugh Jackman) who is angry that Deon’s bots are pulling funding away from his human-piloted Robocop-reminiscing mini-mecha that he really wants out policing Johannesburg despite their police force finding the thing overkill. Unsurprisingly, this means that Chappie’s scale and scope is unnecessarily bloated and unfocussed, which leads to many prolonged stretches where the film gets away from itself, goes loud and big instead of small and intimate, as it visibly strains to manoeuvre itself into the place required for the third act explosions that it feels that it needs to have to occur. It means that everything not immediately, and I do mean immediately, connected to Chappie and its troubled parental upbringing is undercooked and one-dimensional – Jackman’s character, in particular, is literally just a walking collection of Evil Villain In A Sci-Fi Allegory tropes that he is desperately trying to force onto an actual character through sheer force of charisma. Every time the film seems to be building up some head of steam with Chappie, it cuts back to Jackman doing everything but twirl an evil moustache, or arbitrarily reminding us that the walking plot device gang boss is still kicking about, or having an utterly wasted and could-not-be-less-enthused Sigourney Weaver do nothing, or teasing questions about the police force that it will never actually properly address, and all that momentum is drained from the picture. Blomkamp also self-plagiarises from District 9 a lot during its opening – even adopting, and then immediately dropping which makes one wonder why he bothered with it in the first place, a faux-documentary style for the opening two minutes – which keeps the film from hitting the ground running, his action pile-up finale is the definition of obligatory and astoundingly hypocritical, and it introduces ideas and concepts in its final 5 minutes that would have been far better served in their own separate film instead of just being thrown into an already over-full broth just cos. There is also, however, one huge, major, utterly confounding problem that nearly kills the entire movie, because it also infests the stuff that the film actually does right. It’s the kind of decision that keeps the good stuff from hitting with the level of power that it should have and keeps the film, even if it wasn’t a structural mess, from even being in the same league as greatness. It’s the kind of bone-headed inexplicable decision that people like myself are going to spend years trying and failing to adequately rationalise and understand. What is that problem? It is exactly as weird and distracting as it sounds on paper, especially since the film wants you to take them and the film’s world completely seriously but it’s near impossible to do so because, once again, a member of Die Antwoord spends THE ENTIRE FINALE WEARING A CHAPPIE SHIRT! Instead of being wrapped up in the finale, my brain kept being drawn to that shirt as it kept screaming, “Neill Blomkamp, what the f*ck are you doing?! Why would you OK that? !” I might have been able to forgive this if Ninja and Yolandi gave good performances but… well, they’re not actors, let’s put it this way. They’re both clearly trying, which I guess counts for something, but he’s too awkward, she’s too shrill, they are both really out of their depth, and neither manages to properly become their characters instead of just “it’s Die Antwoord trying to act”. And they’re in two of the most vital roles of the film, too, which makes it a miracle that any part of the thing works! Yet, despite the fact that the film is a complete mess that only works about half the time, and even then only about half as well as it should, and the literally inexplicable stunt casting of Die Antwoord in two of the film’s most vital roles… I actually rather like Chappie. Somewhere, buried within this complete mess, there is a charm and sincerity that is able to escape and spread throughout the majority of the film. Chappie itself is charming and cute, Copley nails the part, and the film manages to treat its character (and by extension its surprisingly consistent tone) right, which manages to keep the film from failing utterly for me, and the film is interesting and entertaining enough to have kept me engaged the whole time through (not once did I look at my watch). I am disappointed, because this really should have been better, but that disappointment has, as of roughly 24 hours after sitting down to watch it, yet to turn into anything resembling hatred or resentment or even true dislike of the thing. Yeah, I do kinda like Chappie. Not enough to be able to overlook the major systemic flaws that it objectively has, but enough to be kinda fond of the thing. I’d recommend seeing it, if only so that you can know which side of the divide you’re going to fall on when the debates start up because, again, this one will divide people. Callum Petch is having an existential time crisis. Follow him on the Twitters (@CallumPetch) and listen to Screen 1 on Hullfire Radio every Monday at 9PM BST (site link)!